And Now I Have To Pay $25 For A Bag Of Chips. Happy, Lay's? Last week Lay's decided to award the U.S. potato chip prize to Cheesy Garlic Bread, the least interesting of the three "Do Us a Flavor" competitors. A little over a third of America voted for it, allegedly. That leaves a little under two-thirds of America to the mercy of price-gouging jerks on Amazon and eBay. 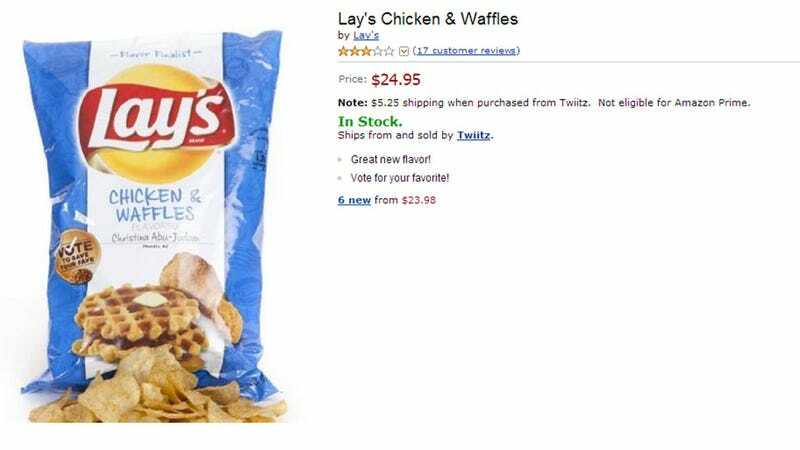 Who is going to spend $24.95 plus shipping for a bag of Chicken and Waffles or Sriracha potato chips? Not me, that's for sure. I only went as high as $20 with shipping on eBay for a bag, and I will savor that bag until Lay's comes to its sense. Hopefully that'll happen before the rebellion.